Air New Zealand has released the latest instalment of its successful ‘Meanwhile in… New Zealand’ campaign – reminding Australians that ‘winter is coming’ to New Zealand – and that its daily services to Christchurch make it easy to explore the Mt Hutt alpine. In the video, well-known Christchurch ice cream makers George and Raewyn Taylor have sold their pure old fashioned ice cream from Victoria Square for 17 years, continuing a tradition since 1907. Methven locals and ice cream critics Stella Isherwood (4), Sonny-Bill McDonald (6), Mae Totty (5) and Freddy Cairns (5) were invited to taste the inventive creations, with the help of Australian food stylist Sian Redgrave who assisted George behind the scenes to develop the flavours. 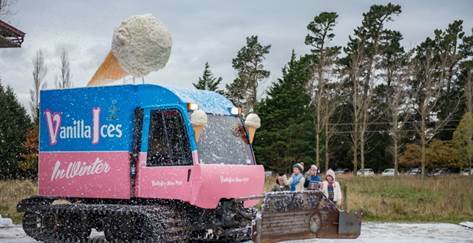 Air New Zealand will arrange for the ice-creams to be sold on the slopes of Mt Hutt in July, during the Australian school holidays. The ‘Meanwhile… in New Zealand’ campaign is designed to showcase what is happening in New Zealand right now, with the aim to boost trans-Tasman tourism over autumn and winter months. Australian visitors to New Zealand this winter will also have the opportunity to win back the cost of their return Air New Zealand flight. Each week from July 1 to August 30, one winner will be selected from those who have tagged a photo or video of their ski trip on Instagram, Facebook or Twitter with #MeanwhileInNZ.